Every dance has its own vocabulary or its own “it-ness” as choreographer David Brick refers to it. For the past three weeks at the Yard, Mr. Brick’s job has been to draw out this “it-ness”, harness it and help three up and coming choreographers dig a little deeper into their work. “Things belong or go away depending on the world of the piece,” Mr. Brick said during a break at the Yard this week. Mr. 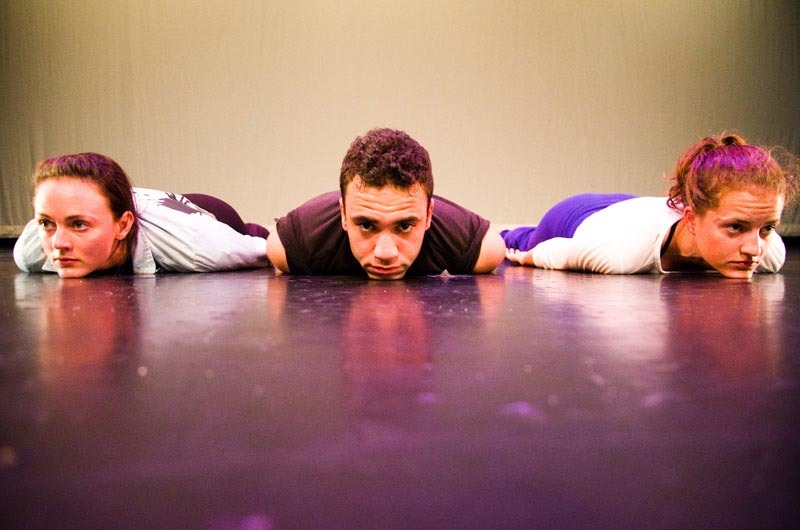 Brick has been mentoring New York choreographers Donnell Oakley and Deborah Lohse and south Asian choreographer Hari Krishan for the annual Bessie Schonenberg residency program. During this residency the choreographers have all been living and working at the Yard to develop original choreography. This weekend they will present their work to the public. The performance is the first of the Yard’s summer season which includes a varied lineup from vaudeville and contemporary dance to tap and puppetry. On Monday, Ms. Oakley sat on a couch with Mr. Brick. Her thick notebook was nearby. “It feels like David can pretty clearly see what the environment is that we’re creating and help to draw something out of us and draw out our natural styles,” she said. The residency program, normally done at the end of the summer, was moved to the spring to provide a quieter environment for the dancers. Since its inception, it has been an anchor in the repertory season to help foster new work. “It’s a very rare place because we can put groups of collaborators and artists for them in one place and pay them to do it,” said David White, artistic and executive director of the Yard. Dance is a resource-starved art form, Mr. Brick said, and an opportunity to provide a sounding board for choreographers is rare. Mr. Brick is the co-artistic director of the Headlong Dance Theater in Philadelphia. Articulating her work has been a particular challenge for Ms. Oakley, she said, and Mr. Brick has encouraged her to keep talking. “Being able to have conversations, listening to him talk to other people about dance . . . it’s a new language, a different language. That’s been something I know I wanted to get out of the residency,” she said. The residency program is just one of many ways to encourage relationships between the artist and the audience, Mr. White added. “We’re really interested in opening the doors to people to try and understand dance from a variety of points of view, and that it can be comedic and serious,” he said. Mr. White has shifted the performance schedule this year to be more inviting, he said. For example, he has created three year residences with major companies like Doug Elkins Choreography, Etc., returning this summer for its third year, David Parker and the Bang group, coming back for the second annual tap festival, and the introduction this summer of Camille A. Brown and Dancers. “I think that’s something with dance; you have to see enough and understand it’s not threatening,” he added. Mr. White is working towards establishing a recognizable repertory and a degree of continuity stretching over the years. Ms. Oakley and Ms. Lohse, for example, were pulled from Mr. Elkins’ dance group to return to the Yard on their own. “This idea that there are these threads is an important thing, like by doing multi-year residencies of our artists we start to make people a part of the community, names people can talk about, say they’ve met them...” said Mr. White. Highlights of the summer season are many and include a performance by Jodi Melnick, Vicky Shick and Jon Kinzel. “What you should get out of it is the enormous grace and elegance of people who are so comfortable in their own skin dancing,” Mr. White said. Everett, a group from Providence that turned an old carriage house into a 75-seat theater and school for at-risk kids in the city, will perform on July 5 and 6. Bridgman/Packer dance presents a “very sensual” video installation performance around Edward Hopper paintings on July 12 and 13, and actress Amy Brenneman performs a monologue for a special benefit show on July 15. The second annual Tap the yard festival takes place from July 25 to August 3 and features world renowned dancers including Jason Samuels Smith, “one of the best known artists in the country if not the world after Savion Glover” said Mr. White. The festival culminates in a benefit performance at the Performing Arts Center at the high school. Tap shoes are encouraged. “Everyone should pull their damn tap shoes out of storage and all the kids who go to Rise and stuff like that should get up and tap with these tap heroes,” Mr. White said. The sheer amount of performances this summer is a departure from recent years at the Yard. Mr. White was hired in 2011 to lead the non-profit arts group in a financially stable direction. A $250,000 anonymous matching grant received this spring has enabled the group to stabilize and leverage the operational budget, Mr. White said, and will help establish a fund to refurbish and expand the Yard’s campus. After the season Mr. White said the Yard would turn its attention to developing a program in the Vineyard school system and create more of a year-round presence.